The boys have been called upon to provide background vocals and that unique boy soprano sound for a number of recording projects. 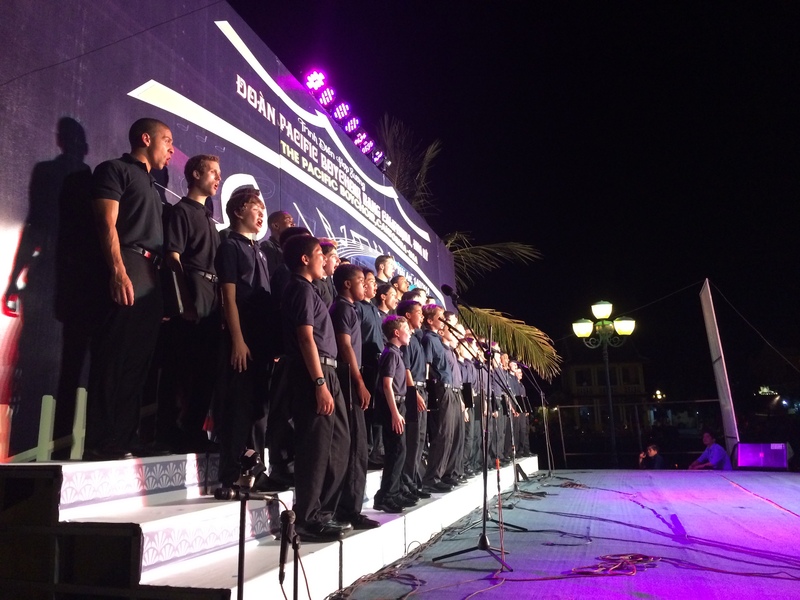 For example, in 2012 the PBA was selected to be the boychoir sound for Soundiron's digital effects library. When the people at Yahoo! wanted a new yodel, and fast, they called the Pacific Boychoir. The jingle has also been used on radio ads across the USA. The PBA has also performed with comedian Zach Galifianakis and has sung for the Chabad Telethon. Contact our office to book the Boychoir for engagements. Fees for the Boychoir vary by length and nature of engagements, and by the number of voices needed. The choir can be hired for concerts that are part of a concert series. In December, the Pacific Boychoir can perform holiday favorites, with or without instruments. During the rest of the year, a Pacific Boychoir concert typically features both classical works and American choral works. The PBA owns its own tour bus, so the choir can be driven to you! For concerts farther away, the boys are seasoned travelers and can be flown anywhere. Concerts for specific repertoire can also be arranged with enough advanced notice. The Pacific Boychoir can present music appropriate for any number of civic events such as awards ceremonies, holiday commemorations, street fairs, or community festivals. Repertoire can be patriotic and/or more specific to the occasion. Making regular appearances to sing the USA National Anthem (and on occasion the Canadian Anthem), the PBA has sung for the San Francisco Giants, Oakland A’s, Oakland Raiders, Golden State Warriors, Cal Basketball, and Stanford Basketball. What better way to celebrate your wedding than with the heavenly voices of boys singing? You can have some of the country's finest boy voices enhance your wedding celebration. The Pacific Boychoir is available for hire as soloists, ensembles, or full choirs for weddings. The boys have sung for weddings at such venues as Grace Cathedral, San Francisco City Hall, St. Peter and Paul Church in San Francisco, and in locations throughout Napa Valley. Recordings of sample wedding songs are available. Fees vary depending on size of ensemble, amount of music requested, transportation considerations, and amount of advanced notice. Let us know what pieces you want, and let us put it together for you, exactly as you envisioned. We can create arrangements for a string quartet or other instruments. We can also arrange for a pianist and/or organist. Please contact our office to find out how we can make your wedding the memorable event you want it to be. PBA has performed for a variety of private events that have included corporate parties, private parties, holiday parties, and family events. Bringing in some of the country's finest choirboys is the perfect idea for your company's holiday party. With enough notice, the boys can learn pretty much any piece of music - accompanied or a cappella. The boys want to sing with you! The PBA has sung with numerous orchestras, choirs, and opera companies, such as the San Francisco Symphony, the Oakland-East Bay Symphony, Berkeley Symphony & Chorus, the California Symphony, the UC Davis Orchestra & Chorus, the American Bach Soloists, the San Francisco Opera, Trinity Lyric Opera, the Youth Orchestra of the Americas, the National Symphony Orchestra of Brasil, the Moscow Chamber Orchestra, the Marcus Shelby Jazz Orchestra, the University of Michigan Men’s Glee Club, the Harvard Men’s Glee Club, the Vienna Boys Choir, the Drakensberg Boys Choir, the Boni Pueri Czech Boys Choir, Denmark’s Herning Boys Choir, Berkeley Ballet Theater, the American Boychoir, and the Santa Clara Chorale. The boys have sung with other choirs and orchestras for pieces by composers such as Britten, Mendelssohn, Mahler, Wagner, Mozart, Bach, Berlioz, Liszt, and Ellington. Do you work for a school in the Bay Area? As a service to the community, the PBA sings at a number of Bay Area schools every year. A school visit is typically a 25-35 minute presentation to entertain kids, but also to teach them about singing and choirs and to get them excited about music. Teaching kids about music is one thing, but showing them other kids that are involved in music is a much more powerful message. Having PBA boys come to your school also sends a broader message to kids that they can achieve their dreams with hard work and a love for what they do.